The key is A flat major. In the introductory prelude of eleven bars an enchanting melody in the left hand unfolds in two matching four-bar phrases beneath a bank of gently pulsating right-hand quavers. This tune swirls with mounting affection – the music is simultaneously passionate and gentle. The tenor register in which this miniature meditation is written suggests a father engrossed in, and delighted by, the new tyrant in his life – his child. 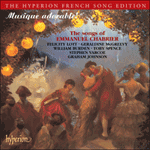 In strophe 2 Laprade has ‘Le gâté du manoir (‘the spoiled one of the manor’) which the composer evidently changed to ‘La gaîté’. Even here, right at the beginning of his song-writing career, Chabrier has a style that is as charming as it is inimitable. Left-hand open fifths are made saucier by crushed grace-notes which establish an earthy folksiness in the music. The composer was always scornful of (and perhaps intimidated by) the niceties and politesse of the salon, and he relished any chance to remind us of his auvergnat credentials. This use of the acciaccatura, almost for the hell of it, is a typical Chabrierian touch and the effect is like a delighted chuckle built into the music. If the accompaniment suggests the composer’s own imaginings of fatherly pride (he was to be a father himself twelve years later) the entry of the soprano adds a mother’s solicitude. Although Chabrier did not designate which voice he had in mind for the song, the supple charm and floating flexibility of the vocal writing suggests the lighter touch of the female voice. In the partnership of singer and accompanist we can sense both parents standing around the cradle paying homage to the little king in their midst. (The composer is amusingly aware of the imperious nature of a child’s demands and reflects this in the stamping bass and forte dynamic at ‘Il est roi, le bel enfant’ – one is reminded of Rossini’s scurrilous Chanson du bébé). Even at this stage the twenty-one-year-old composer has an astonishing ability to spin a melody which seems perfectly proportioned and inevitable without excluding the possibility of delicious surprises en route – such as the sudden flattening of the harmony into the minor tonality in the closing cadence. The song is completely strophic in the manner of couplets: it is thus less modern in form than many of the more or less contemporary mélodies of Gounod, Saint-Saëns and the young Fauré, but the piano writing is much more daring and characterful than almost anything to be found in the composers of the old-fashioned romance. Even at this early stage Chabrier is able to set out his unique stylistic stall. Que chacun dit sa chanson! As soon as he smiles! The flower in the border. That we all gather the grapes!